Tip form: Straight with a rugged tip. Design: Smooth gripping surfaces, gripping surfaces without grooves. Non-glare black coated, anti-static. Anti-magnetic and acid-resistant. Surface resistance 10^6 - 10^9 ohms. Material: Special alloyed, non-rusting, chromium-nickel stainless steel. 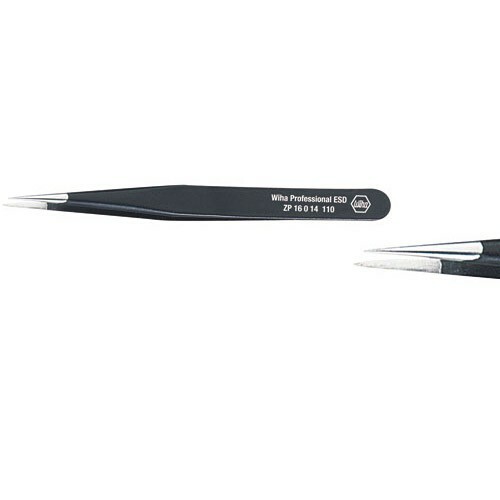 Application: Precision tweezers for gripping and holding electronic components. All content is the sole ownership of PMTech (Anglia) Ltd - Copyright © 2019 - All Rights Reserved.